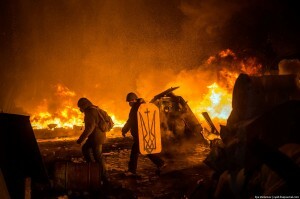 Is There a Replay of the Euromaidan Psy-op in Ukraine Before a Coup in USA? The anti-Russian “indictment” hysteria that we currently observe in the United States has so many similarities with the Euromaidan psy-ops that was waged by the “glocal” media against people in Ukraine in 2013-2014. (1) In both cases, there has been a strong appeal to identity. During Euromaindan, they were agitating people by tackling into their national identity, with the concepts of sovereignty (“nezalezhnost’”) being peddled endlessly back then. In present case, with American liberals, there’s a constant emotional appeal to “democratic values”: “We, as a democratic nation, should build ties with other democracies, not tyrannies”. or “Our democracy came under attack!”, etc. (2) In both cases, there’s a definite boogeyman. During Euromaidan, it was “evil tyrant” Yanukovich and his supposed Russian bosses. In present day US, it is “traitor” Trump and his supposed Russian curators. (3) In both cases, people have been agitated to hysteria with a constant stream of baseless, emotionally charged propaganda and fear-mongering, when you get one “shocking news” after another, so there’s less time to stop and process all the information consciously and logically. Eventually, it all forms a multi-level narrative, leading to a toxic mixture of confirmation bias, the bandwagon effect, and what social psychologists would call availability cascade (or availability heuristics), when people are more likely to believe or remember something if it falls in line with what they have been hearing lately. (4) In this way, even if something appears too bizarre to be true, people are more likely to believe it anyway because they have been hearing so many similar stories in recent past, regardless of whether those stories actually turned out to be true to begin with. But, hey, if everyone says it’s true, then it must be true, right?. So, after a certain period, people get completely brainwashed into a parallel reality. And if emotional agitation is intense enough, people fall into “hysteria” mode, loosing their capacity for logical reasoning, at least, when it comes to this particular subject. From then on, people become easier to manipulate, and it only gets worse. (5) So, in both cases, we’ve seen masses of people being brainwashed with heavily charged mantras, emotionally loaded slogans and codewords in a coordinated manner. For example, try to see how many times the US mainstream media said that Trump “threw intelligence agencies under the bus”. This appeals to their values and identities, forming an image of an external threat, fear-mongering to the extent that people actually began to experience sleep issues, panic attacks, and other unpleasant symptoms. (6) Interestingly, in both cases, the psy-ops/information campaign was run in the interest of people who appear close to the American neoconservatives such as Victoria Nuland and her husband Robert Kagan. Remember the role they played in the Euromaidan regime change? Coincidentally, people from those circles are strongly pro-NATO, they hate Russia as a sovereign geopolitical player and they are less than comfortable with Trump and the promises he made during his election campaign in regards to foreign policy. Could it be that some power groups in Washington D.C. are currently dusting off the schemes that were perfected during the Arab Spring and Euromaidan years ago and applying them on the US soil?